Two great local bands and past Advocate Sessions groups will be performing at the Stone Church in Brattleboro this Friday. 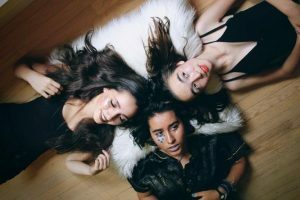 Kalliope Jones is a teenage post-rock group with rich vocal harmonies and catchy original indie rock hooks. The band is one of the best in the Valley. If you haven’t heard them live, I implore you to do so. Your eardrums will be happy. Meanwhile, Moving Day is the musical duo project of Rocco Desgres (tenor guitar/ vocals) and Robbie Juarez (drums/vocals) that’s a little bit 1960s pop, a little bit theatrical in its stage presence, and a whole lot of rock n’ roll. The Stone Church, 210 Main St., Brattleboro, VT, 8-11 p.m. $10 general admission. $13 loft. I got a little emotional reading this issue’s Basemental. The Flywheel was one of my early happy places when I was first getting into going to shows in my late teens. Can’t believe that’s 20 years ago! To celebrate their birthday, the month of April is jam-packed with shows but also some events as well. During the day on Saturday the 2019 Pioneer Valley Zine Fest which is part of Easthampton’s Bookfest will take place from 11 a.m. – 4 p.m., admission is free. Check out dozens of zine distributors all over the Northeast. At night time at the Flywheel, post-punk legends from NYC Bush Tetras will be headlining a punk show which also has Can Kickers, Bunnies, Rogue Conjurer, and Les DéRailleurs on the bill. That fun starts at 6:30 p.m. and the admission for the show is $20. Some may say the ticket price is higher than normal shows at the venue, but they stated on their facebook page: “We did this so that these shows would act as fundraisers for the space.” So a contribution to the arts and culture of the venue while enjoying a good punk show will be on the menu. 43 Main St., Easthampton. Historic Deerfield is hosting a Patriot’s Day celebration this Saturday that’s all about traveling back in time to experience what it might have been like to live during Revolutionary War era America. There will be live re-enactments with cannon-firing, musket drills, and also period-specific crafts activities and fife and drum music. The event is free with general admission to Historic Deerfield, 80 Old Main St., Deerfield. 10 a.m. to 4 p.m. General admissions: $18 for adults; $5 for youth ages 6-17. Those under 6 get in free.